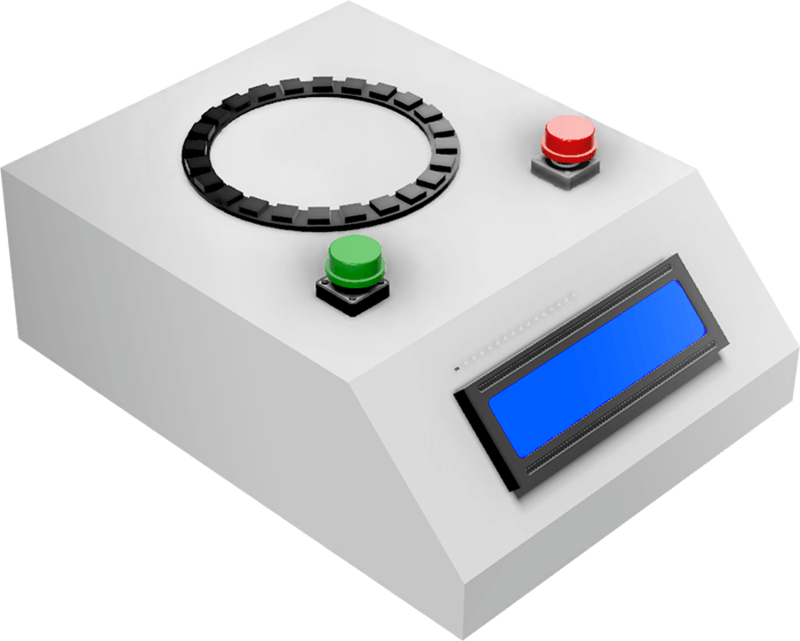 Four international students and I completed this project for an Interaction Design module. My role was that of researcher, designer, and video editor. 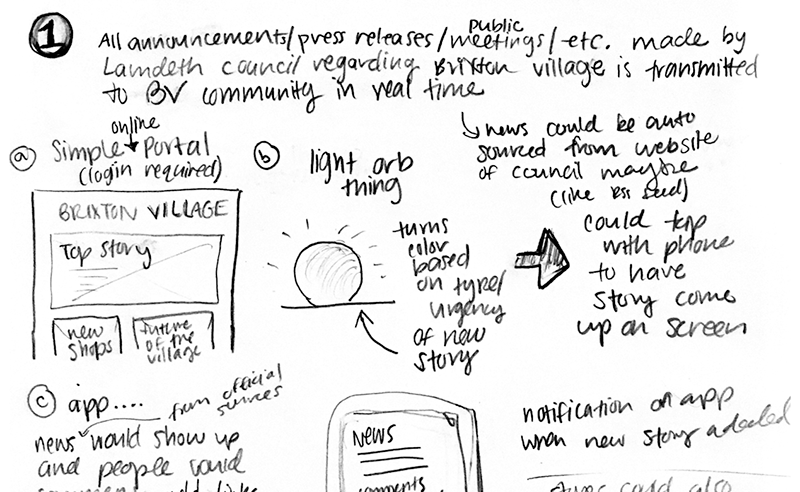 The task was to use a human-centered design approach to develop a new way to support, empower, or change the behavior of a group (Brixton Village traders) around a shared area of interest. The project was completed over three months. Brixton Village and Market Row are historic indoor markets in Brixton, a district of south London. The markets house over 125 shops, restaurants, and grocers. 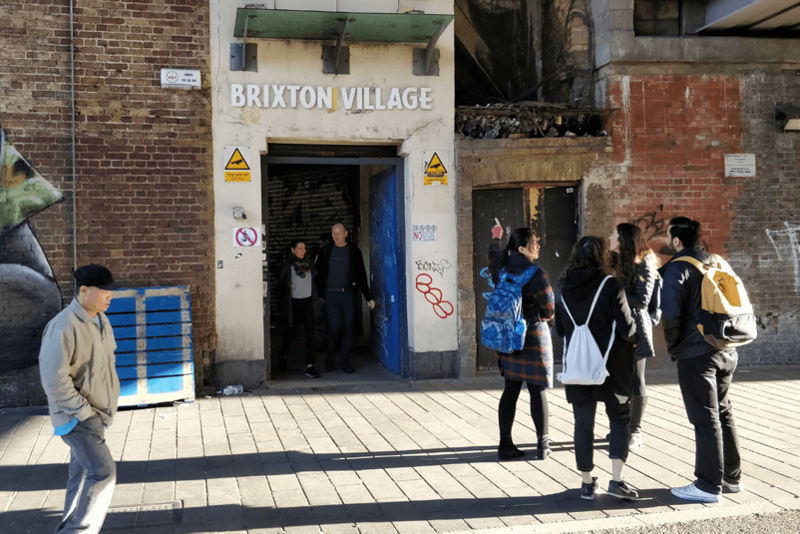 Initial research involved traveling to Brixton Village (BV) with my team to observe the market and interview traders & employees to learn more about the community. Interviewees varied in age, gender, and business type. 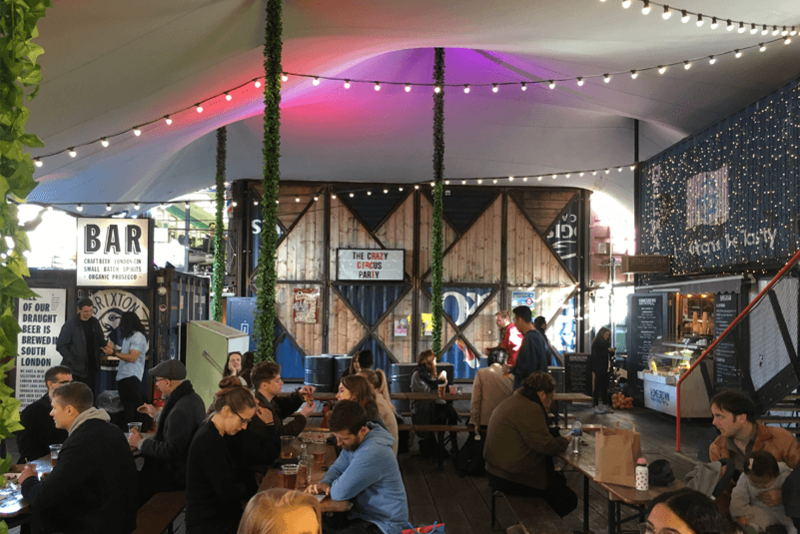 We also visited a nearby competitor (Pop Brixton) mentioned in interviews. In addition, two team members interviewed BV management. We compiled data from interview recordings, interview notes, and observations and wrote it on sticky notes. Then used the sticky notes to create an affinity diagram to uncover themes in our research. Top themes included (1) Communication - traders don't communicate / feel lonely / disunited, (2) Money - cash only and inconvenient ATMs make it harder to buy, and (3) Technology - some traders use modern technology while other do not. As a team, we chose to focus on communication. After our analysis, we conducted an in-situ survey of 20 BV traders and employees to explore their communication and information seeking behavior. The goal was to test the following assumptions: (1) traders/employees want more say in BV village decisions, (2) traders/employees are lonely and need help connecting and (3) the way traders/employees get information now is disorganized. Top findings were (1) speaking face-to-face is #1 method of communication within BV, (2) news is received from co-workers (40%), BV management (30%), social media (25%), and local publications (15%), (3) respondents don’t report wanting more say in decision making processes, and (4) communication within BV is perceived as disorganized. In addition, respondents felt a need for PR/Marketing opportunities. We incorporated survey findings into our affinity diagram, adjusting categories and groupings when needed. 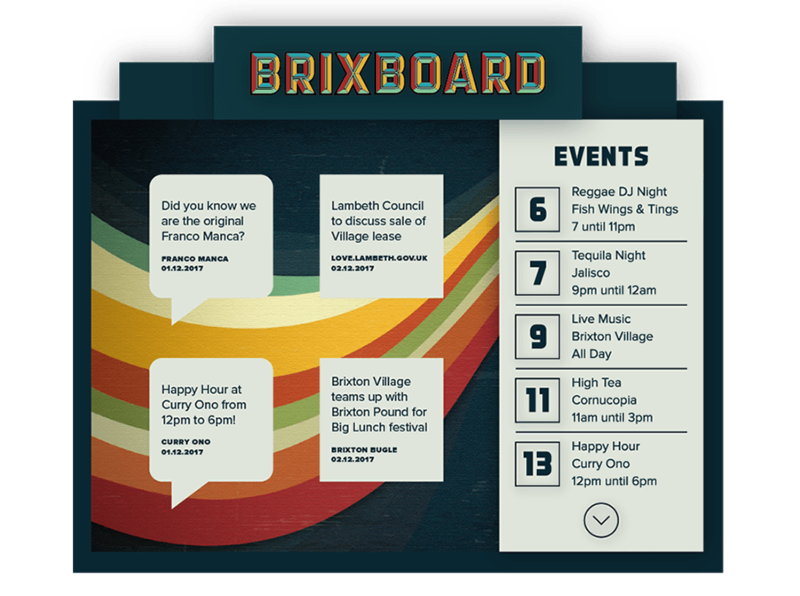 The result was a more specific focus: communication between businesses, trader-management communication, and communication of Brixton Village news to traders. 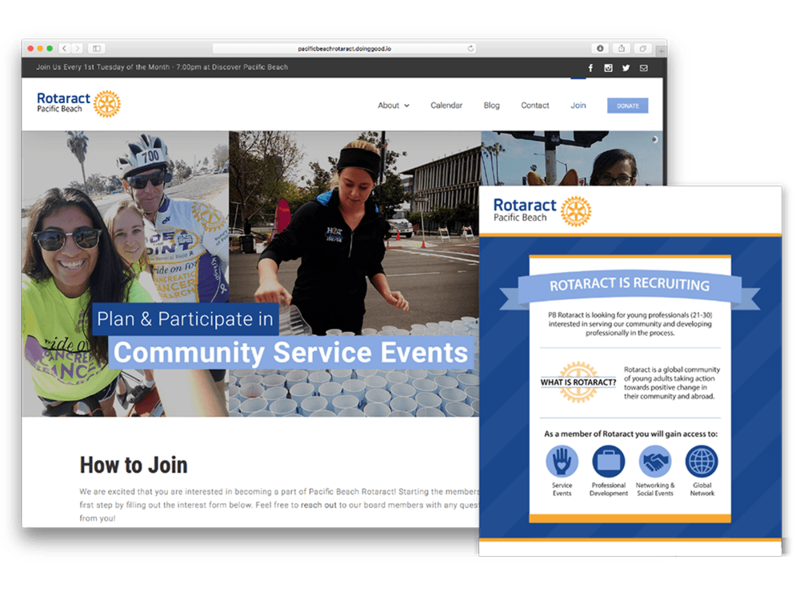 Interview, observation, and survey findings were used to create design principles. We determined that the solution needed to be (1) inexpensive to implement, (2) accessible to users with varying levels of tech literacy / access, (3) integratabtle into trader’s current workflow, and (4) engaging for traders/management. To begin, each team member brainstormed using the 10+10 method. Next, we presented our sketches and consolidated similar concepts. 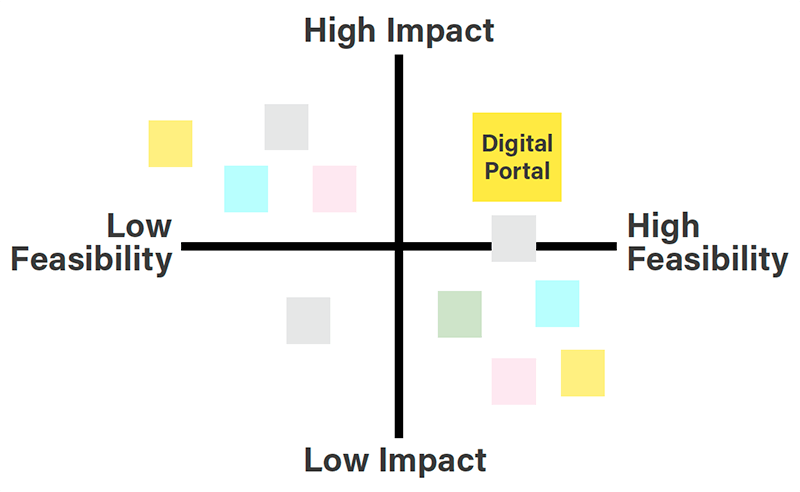 Then we mapped ideas according to impact and feasibility on a 2x2 matrix. Finally, we chose an idea with a good balance of feasibility and impact to pursue: digital portals that allowed traders to communicate with each other and management. 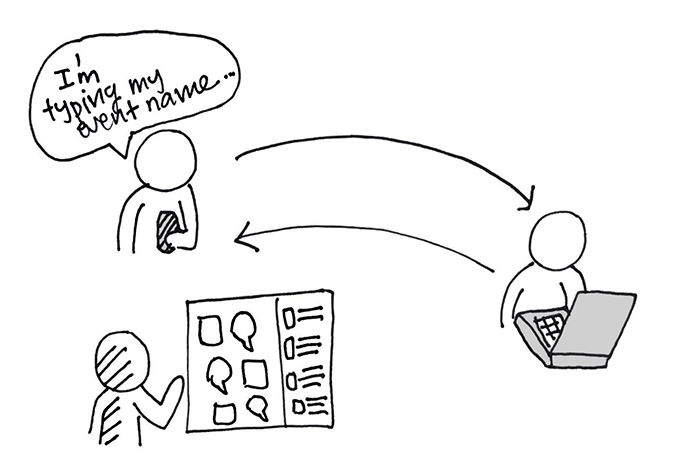 As a team, we crafted user stories based on research-backed personas (created by a team member) to determine portal functionalities. We then conducted a card sorting activity with BV traders to test our assumptions. Traders were asked to rank functionalities (eg. contact management, read BV news) from most to least important. 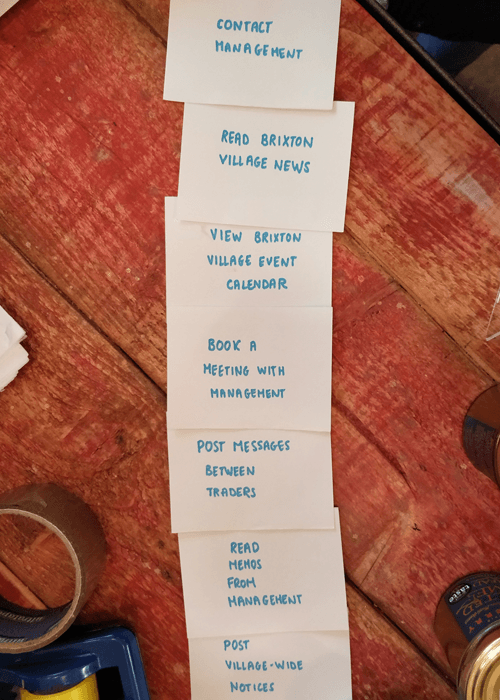 According to card sort, top features for traders were (1) access BV news, (2) contact management, (3) post and view events, and (4) view memos from management. To facilitate communication between traders and the community, we pivoted from a private portal to a public display. 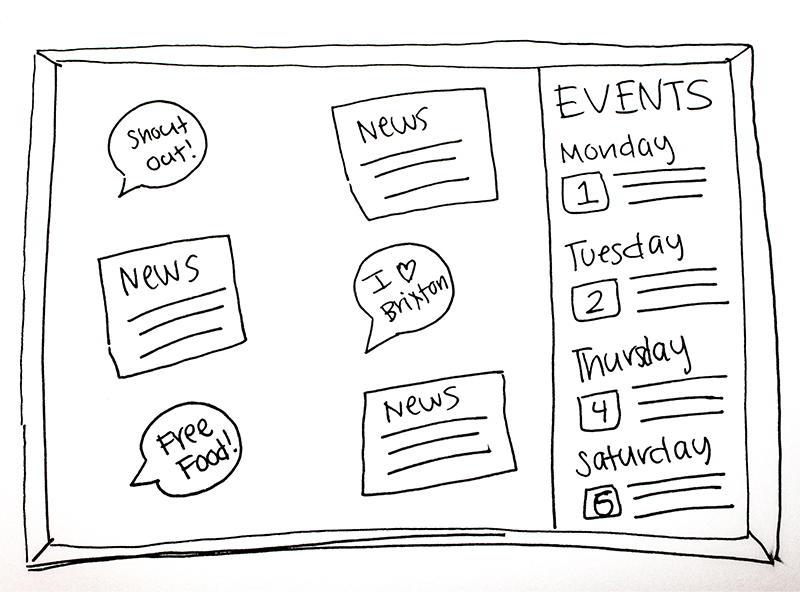 This display would serve as a digital notice board where traders could post shout-outs, share events, and read news sourced from local media. 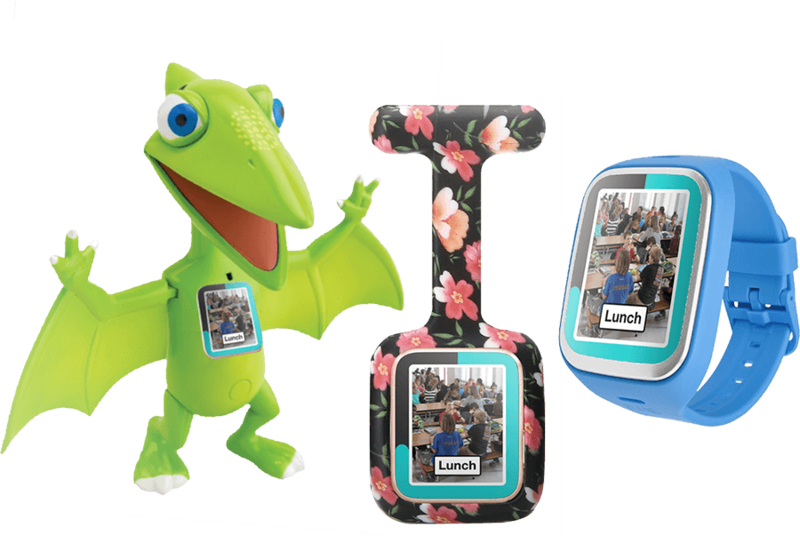 To increase reach, events and shoutouts would push to BV's social media channels. 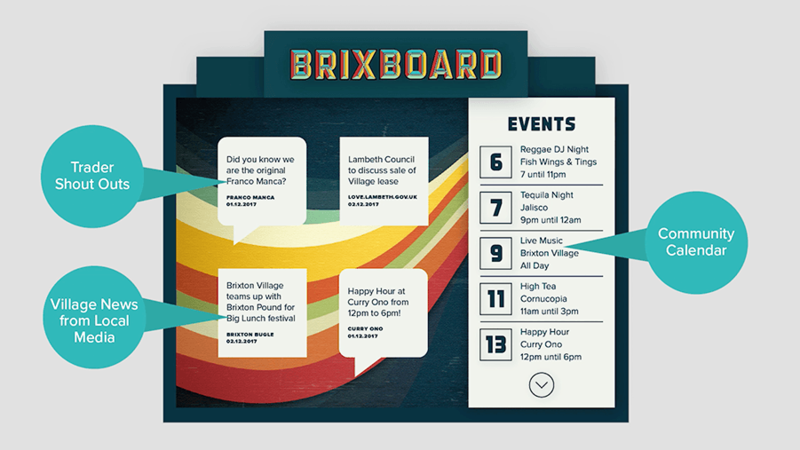 We named the design Brixboard. 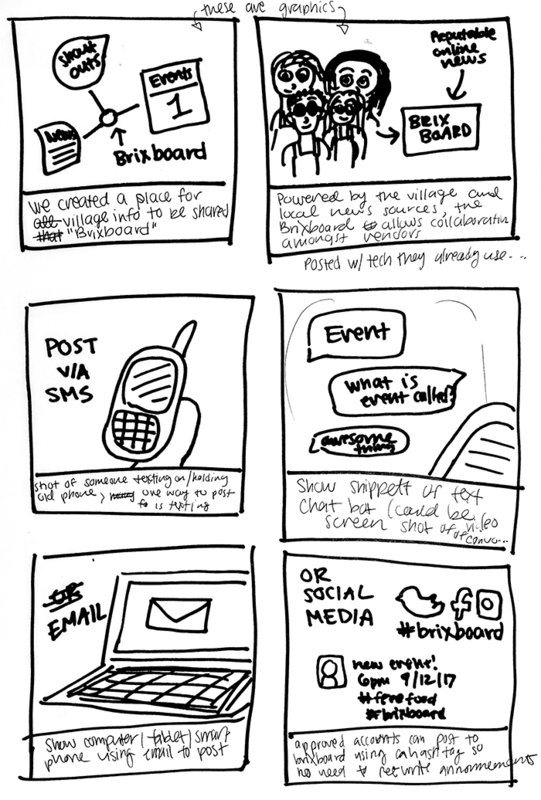 To ensure traders of all levels of tech access and tech literacy could post to the board, we came up with three modalities: SMS chatbot (for those without access to internet), email, and social media hashtag. 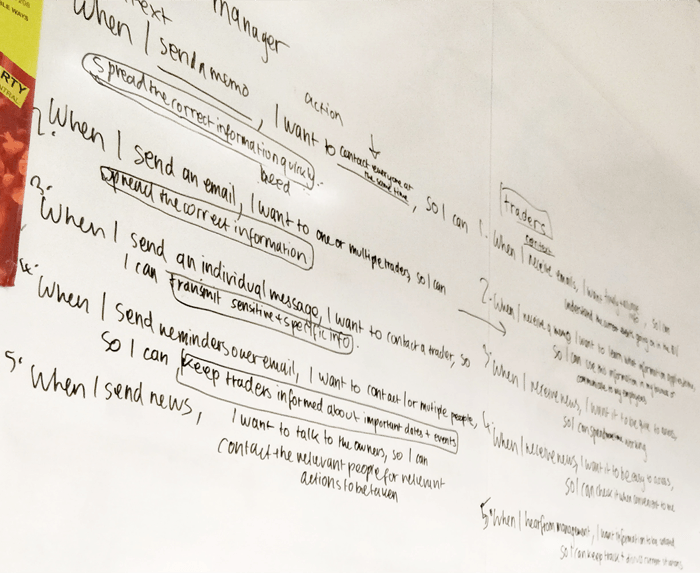 A team member and I created a user flow for the SMS chatbot that covered posting/editing/deleting an event or shoutout. Once we had a draft, we ran through the interactions to find and fix problem areas. Finally we exported the results as a diagram. 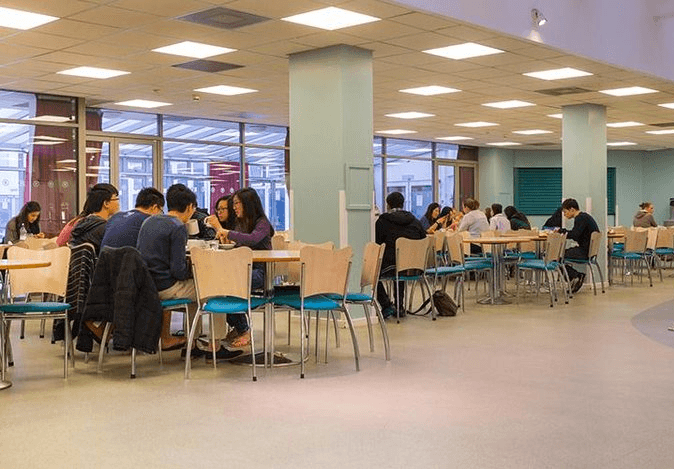 Since trader’s busy schedules prevented them from participating in our user testing, we relied on a linguistically and culturally diverse convenience sample (10 students from an international student accommodation). 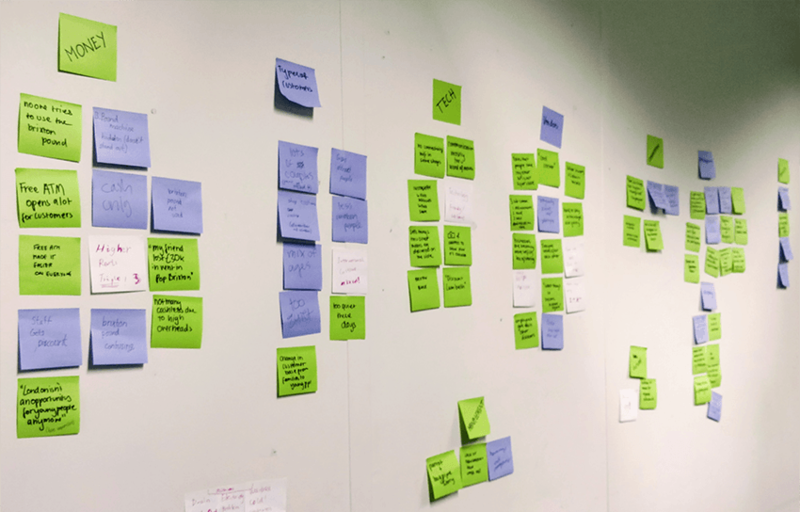 We used the Wizard of Oz technique combined with think aloud to test our user flow. Most users found the chatbot straightforward and east to use. However, testing did reveal that some messages, such as "When is your event? ", did not make the desired response format clear. We fixed this by adding further instructions (eg. reply in DD/MM/YY format). To present this idea to a panel of professors, we created a video. I was in charge of planning storyboarding, directing, and producing the final video. 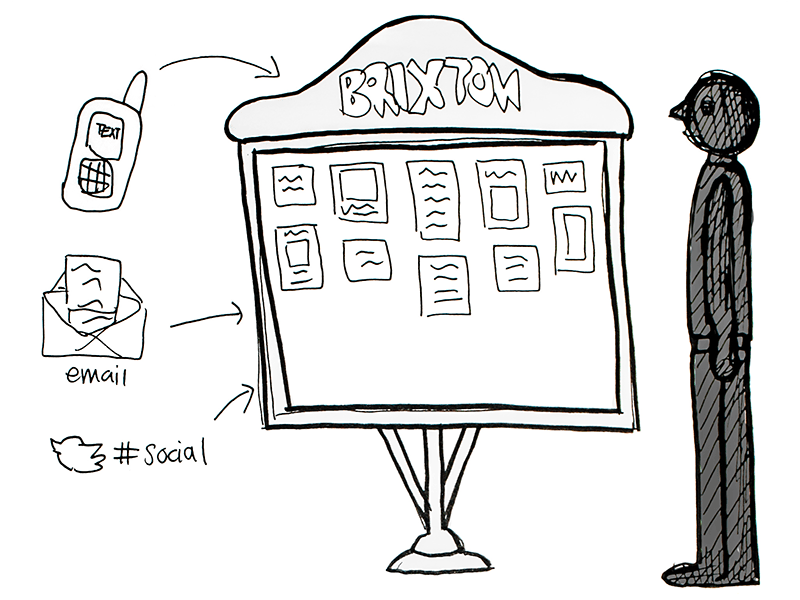 The purpose of the video was to (1) frame the problem, (2) introduce Brixboard, and (3) present a video prototype.